1. Prevent the two side walls from pulling away from each other, by adding horizontal braces that go from side to side, at the tops of the walls. 2. Stiffen the back wall, by bolting one or more pieces of solid material all the way across the wall. Some creative folks have tied this solid bracing material into the design of sturdy benches. 3. Stiffen the front wall, bolting a piece of solid material over the doorway. 4. Prevent the C-shaped steel base from flexing. This can be done by bolting small plates of some type to the top and bottom lip of the base at regular intervals, or by covering the inside of the base entirely with wood that's also attached to the top and bottom lip of the base. 5. Strengthen the corner posts, by adding reinforcements at the bottom of the posts. This is where some reading on the internet is time well spent. It's really helpful to look at photos of other HF 10 x 12 greenhouses shared by posters on the GardenWeb forum. They’re each worth considering for their good ideas. We decided the first four modifications above were the most important for us. 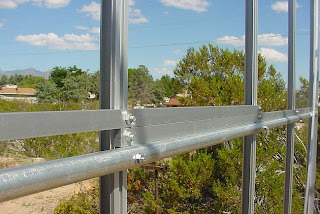 If aluminum comes in contact with steel, a corrosive reaction occurs that causes the steel to rust. 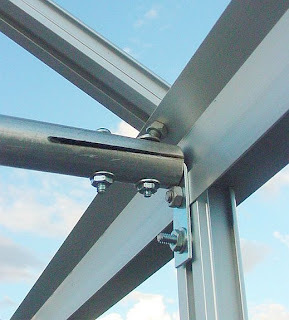 So, regular steel angle iron isn’t a good choice for bracing. Aluminum angle stock is one solution, but it can be hard to find in long lengths, and fairly expensive. 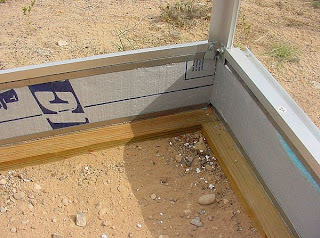 Another solution is to use EMT (electrical metal tubing) since it’s galvanized, fairly easy to bend and cut, easy to find and cheap. We started with the side-to-side wall braces. People usually use either ½” EMT or ¾” EMT for these, and they usually add two or three braces. We decided on three braces made from ¾” EMT. TIP: Stop and check for squareness again. The more braces you add to the structure, the harder it is to correct if it's out of square. If it's out of square, the panels may not fit into the frame correctly later. We measured diagonally from corner to corner inside, and we used a level on each corner post. Better safe now than sorry later! 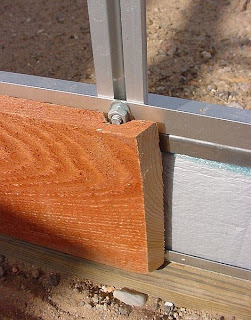 A good basic way to attach EMT braces is to flatten the ends for several inches, bend the ends 90°, drill for bolts, and attach them to the greenhouse wall studs. 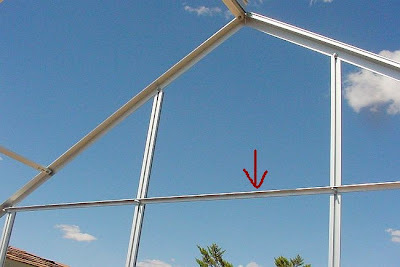 There are many good photos of this attachment method on the Garden Web greenhouse forum. We tried something different, using 2" plated L brackets and bolts. First, L brackets were attached to the top of the stud. Tip: We didn’t have T bolts on hand to add to the stud tracks, so we used 3/16” carriage bolts, clipping off part of the flange on the head with bolt cutters. This left a rather jagged head that slipped into the track, and grabbed the inside of the track nicely when turned. We held up each length of EMT to make sure the length was right before cutting. We wanted a snug fit to keep the side walls parallel and stable during wind. Our braces turned out to be a bit over 116", but (of course) you should measure your own structure carefully to determine the length you need. 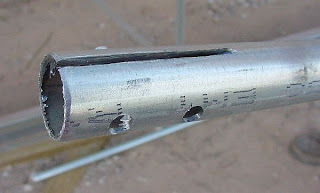 Each ¾” EMT brace was drilled all the way through on one end, to accept two bolts. 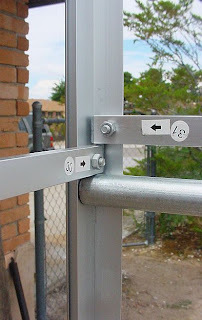 One end of the brace goes over the L bracket, and is secured it with bolts. Slipping the bolts through can be a little fiddly because you're working around the nuts already in place (tight quarters.) We found it best to install the bolts first on both ends, then go back and add the nuts and washers last. 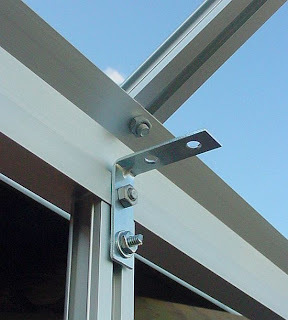 The slot allows the other end of the brace to slip sideways onto the L bracket, and it’s also secured with two bolts. Three EMT braces now connect the three central studs of each wall. To stiffen the back wall, we used another piece of ¾” EMT, running corner to corner, snugged up against the bottom of the central Part 31 braces. Once again, we drilled holes in the EMT and used our modified carriage bolts in the tracks. …and we secured it with one sheet metal screw from the outside of the greenhouse, as shown here. We used a sheet metal screw because the head needs to be flat enough to not obstruct the polycarbonate panel, which will cover this area entirely. So, here’s the back wall with the EMT brace in place, right under the center Part 31 braces. This single EMT brace makes a big improvement in the stiffness of the back wall, and it would be easy to another later if we feel it’s necessary. The frame over the door also benefits from stiffening; it prevents the front wall from flexing, and it also helps the sliding doors to work more smoothly. We could have figured out a way to use EMT or aluminum angle here, but we got creative and used a 1” by 2” piece of oak instead. We’re planning on building sliding screen doors for the greenhouse later, and the wood will allow us to attach the track for the screen doors more easily. A piece long enough to go corner to corner would have been better, but we used what we had, which was 8’ long. Even so, adding this piece made a big difference in the front wall strength. …and we secured it at close intervals with wood screws and washers on the outside of the greenhouse. 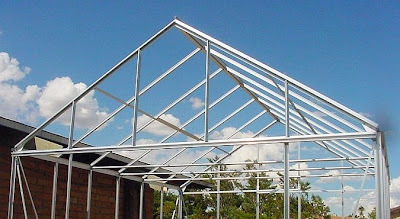 In addition, we decided to add a lightweight horizontal brace to the upper part of each gable end of the greenhouse. We used 6’ lengths of aluminum angle, ½” by ½” by 1/16” thick. That's pretty thin, but we were surprised how even this small brace helped stiffen everything up. 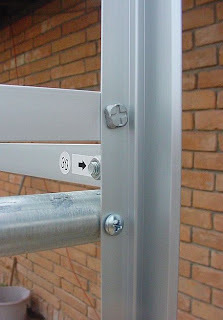 Once again, they were secured to the wall studs using modified carriage bolts. At the ends of the pieces, we drilled holes in the frame and added sheet metal screws. The last modification we made was to prevent the c-shaped steel base from flexing when wind pushes on the greenhouse walls. It also gave us a chance to add some insulation. We used ¾” thick expanded polystyrene (styrofoam) insulation, cut into strips about 4 ¼” wide. We also stuffed some foam sill insulation in there first, to remove as many air pockets as possible. 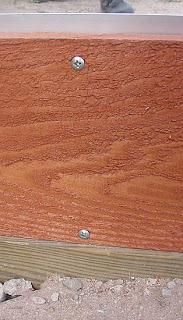 To stiffen the base (and protect the insulation) we attached boards made from 1” x 6” red cedar fence pickets. Before attaching them, I stained the boards with a redwood stain I was also using on the benches. Since the boards were actually 5 ½” tall, we notched out areas around the nuts and bolts. This wasn’t fun, but the soft cedar cut pretty easily with a box knife. In this photo you can still see the top and bottom lips of the steel base, which is where we'll put the screws, through the board and into the steel. We drilled pilot holes through the board into the top and bottom lip of the steel base, and secured the boards with sheet metal screws, about every 18” around the greenhouse perimeter. Now the base is insulated, and stiffened by the attached board...and it looks a little dressier, too. We took a break at this point to do some work while we could still enjoy the open breeze in the greenhouse frame. We stubbed in the electric and water lines, and concreted in the supports for our benches to come. (More about our benches in the Greenhouse Enhancements section.) We also added concrete pavers in the walkways, and gravel under the bench areas. So, now our greenhouse looks like this. Click here to go to Part Six: Adding the Panels. 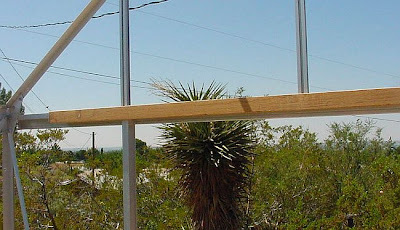 When we added our ¾" EMT wall-to-wall braces, after cutting the rafter tubes to the correct lengths, I cut a 2½" piece off the end of an old 2x4 and (with the EMT in a pipe vise) drove the wood into each end of the "rafter", with the grain running parallel to the tube itself. 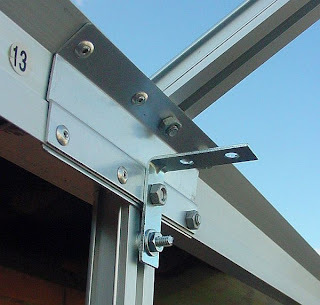 The end is about ½" inside the tube to allow the bolt securing the L bracket to the stud to fit inside the rafter. The purpose of this homemade dowel plug is to resist the compression the bolts will cause later. I was able to "reef" down on those bolts a lot more than I'd have been able to do with only the steel wall of the tubing to resist the stress. Using my reciprocating saw, I cut a small notch (to accommodate the stiffening ridge in my L brackets) at the top on each end, and then I drilled two holes for the bolts. Two get these precise, I used a waterhose clamp to hold the L bracket onto the tube and drilled through the factory holes down through the tube with its dowel plug. In the greenhouse itself, I attached the L brackets just as you did, but, instead of attaching the the rafter tubes around the L bracket (with your slot), I placed the rafter tubes below the brackets and inserted the bolts, head uppermost, through the brackets and then the rafters. 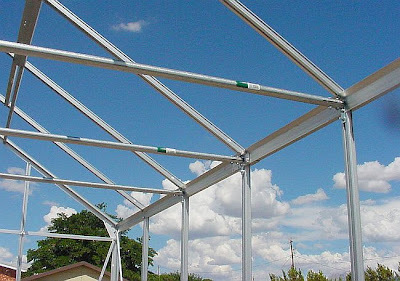 I described in an earlier comment how we will (in the future, perhaps on New Year's Day — tomorrow) weld trusses together to further strengthen the roof against our heavy Colorado snows. The neighbor who'll be doing the work will get a lot of tomatoes, and may even (I hope) build his own greenhouse when he sees how beneficial it will be. To design the trusses, I took a piece of the outside carton the greenhouse came in, and made a template that fits precisely up against both sides of the roof (the template "roof edges") and right along the new rafters (the "rafter edge"). Then, using the geometry principle that any radius of a circle is perpendicular to the tangent at the point of intersection, I used a carpenter's square (with an extension along one leg) to draw the line that began at the center of the rafter edge at one end and exactly 90° from a roof edge at the other. The next step was to connect the two points on the roof edges at the ends of the new truss members. This line is length of the third truss member. It turns out that the resulting triangle is very nearly, but not quite, an equilateral triangle; the soon-to-be horizontal member is an inch or so longer than the other two legs (which must be equal). Each truss will be welded to its rafter tube, point down. This means, of course, I'll have to remove the rafter tubes (no trivial feat, I assure you) before we do the welding. Then, using Simpson nailing plates bent into a square "U" shape to fit around the ½" EMT we're using for the other three truss members, I will connect the upper (third) side of the truss to the roof beams with the 6mm bolts we slid into place earlier. Two 3/16" bolts on each end connect the truss members to my homemade "U" brackets. 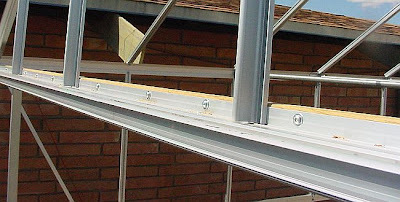 I use bolts here, rather than welding the brackets directly to the trusses because there will probably be some variance between what we measured and what we end up with after the construction. Happy New Year, Le! 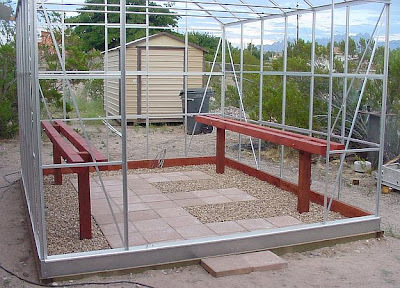 All of your well-thought-out modifications make sense to me, and I agree that it's a good idea for Harbor Freight greenhouse owners in heavy snow areas to consider adding additional strength. 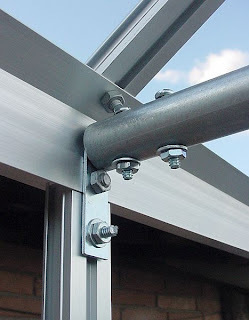 The aluminum roof studs of the Harbor Freight are certainly not designed to withstand heavy loads, and I've read about roof stud failure under heavy snow, in some cases, if unsupported. Your modifications are a good example of what's great about this project; the kit (as is) gives us all a good starting point. From there, we can go forward and make prudent modifications based on the demands of our own climates. The internet is a terrific way to share problem-solving ideas with others, and I appreciate your posting here. Stay warm! What a blessing to find your highly detailed account of assembling your HFGH. A greatly encouraging contribution, particularly the notes and pictures about assembling the doors and the reenforcing EMTs. I can't thank you enough for taking the time to put this all together. At one point I was ready to throw in the towel, but now the frame is all up, and I am almost smelling the ripe tomatoes! Hello Jack, I'm very glad this has been helpful. My HFGH just made it through a 4" snow and -5F temps (a 35-year record for our part of southern NM.) I've learned a few more things about this greenhouse in very cold temps (the doors did freeze shut, as others have mentioned.) But overall I continue to be very pleased. I hope you'll persevere and enjoy those tomatoes eventually. First of all, Thank you for your guidance in the building process! Without it, assembly would have been even a bigger pain! Not that it was pain free. I have completed the framing, except the roof, to hot today. So, I decided to put the doors and windows together. I think I got the doors correct on the third try! Windows have the same 1/2 inch gap problem. I think I will screw them in place. Does that work, or is silicon better? Did you use any weather stripping on the windows? I made all of the strength modifications that you did. Are there any additions that you learned over time? I am a little concerned with the Floor Plates (1a-6)as they are only attached on the inside edge. I am thinking of installing 2 screws between each wall stud (14-16, 28,29)into the frame (43-44). Any issues that you can see? Again, so far you help has made this project much easier. I worked with metal and sheet metal most of my life and this was a challenge to understand the directions and sometimes had to fall back on what made sense! We did not find the need to add any modifications for strength, over time, beyond what is shown in the blog. We did add shelves to both sides (as shown in the last part of the blog) which were in turn firmly supported/attached to our heavy wooden benches, and the benches have posts concreted into the ground. So, we're sure that adds some degree of extra strength for us. I did have to add more clips to one leading panel edge on the southwest corner, one time. This seems to be the corner of our greenhouse that is most hammered by prevailing winds. It popped a few clips off, but the screws held the panel in place (thank goodness) until we noticed the clips missing on that edge. I doubled up on the clips on the one edge of that first wall panel, and no other problems in 8 years. I usually advise folks to really watch their new greenhouse at first, as all of us have different orientations/protections, so we all have different experiences and weak points. The front Floor Plates (1a and 2a) appear to have been slightly redesigned from the older version of the 10x12 (model 93358) to the newer version (Model 69893.) Harbor Freight is still selling both versions of the kit; your model number is on the front of the manual. So, your kit might be a bit different from ours, for those pieces. We have worked with metal for years also, and still had the problems you did. Believe it or not, the manual has been improved and revised numerous times since we built ours, but it's still a challenge. Hope this helps. Best of luck with your build! I have the same model,93358, and the Manual is the same as the one on the Web. The floor plates can be easily lifted at the outer edge, just seems weak. As far as the front plates, 1a and 2a,I am concerned with someone catching the edge of the plate coming in the door. This would bend it and cause the door some issues. Have you had any issues in this area? I may add Stainless Steel pop rivets to keep the area as smooth as possible? Window Vents: I was thinking of adding the weather stripping in the 1/2 inch space to keep the panel from moving? Silicone is probably better? My doors will face South, the direction the wind comes from. We get 60 MPH winds in Winter months here in Grass Valley, CA. This is the reason I want to make sure it is not going to flex to much. One failure would be the end of the HFGH! The foundation is 4"X6" Pressure treated,on edge, and it has 10 ea. 24" steel stakes holding it to mother earth. I screwed the base frame to the wood every 12", with 6" spacing at the corners. Also, added the wood all the way around the inside of the base. So, the next seemingly weak point is the floor plates. I have added the 3 ea. 3/4 EMT pipes to the rafters and the one on the rear wall. Also will put the 3/4 inch alum. angle in the A frame, front and back. I have one extra 3/4 EMT which I was going to use on the front, above the Door, the same place you used the wood. Any Issues? Attach it with screws as you did the wood? The extra strengthening is a must for all builds! The stronger the better! Thanks again for all the wisdom and encouragement you give all the HFGH owners. Hi Jack, Ok, so you have the same version we do. Yes, the floor plates can be lifted at the outer edge. The only place this seems annoying is at the front, 1a and 2a, as you said. We did not screw ours down, and I think we have both accidentally caught or kicked that front plate a bit, as we do have to step up into the greenhouse (from paver steps I built outside.) We have not done any damage to it, though; not enough to bend it, although I suppose that is possible. I can see the appeal of adding flush screws or pop rivets to these front plates, for peace of mind. If you do it, just be sure not to stress or tweak the front plates out of position at all, as you can see they also form the bottom sliding track for the doors. If you accidentally pulled these floor plates out of whack, so they were no longer completely flat, I think it could make problems for your sliding doors. So I'd just be very careful when I did it. I honestly can't remember for sure, but if I tried weather stripping in the window vents, I don't think it would have stayed in place. My problem was, our prevailing winds were just right to pick up the window vents and drop them down again...this, even when they were in the closed and locked down position. There was just enough play in the latch so it was possible for the windows to bang bang bang, all day, in bad winds. Eventually the vibration made one of the poly panels start to wiggle out of place, so I'd had enough. We removed all the windows, and I used silicone caulk on all the window panels. No more problems with moving polycarbonate. However, the bang-bang-bang vibration problem continued, so eventually I just abandoned the idea of using the window vents at all, and wired them tight shut. By that time I had already built the screens for my south wall, and we had installed our exhaust fan, so I felt I could survive the loss of ventilation through the roof. The window vents are not my favorite part of this kit. Some folks have reported being happy installing automated window openers, and perhaps that would have resolved my problem. I didn't try those. Our strongest winds blow right on our doors, also, on the west end of our greenhouse. When we get our spring winds with gusts in the 55-60mph range, I usually put two sturdy spring clamps on the doors, to hold them closed, so they won't fly open when the wind pounds on them. I can do this because I put screens on the south wall in the summer months, so I still have ventilation for the plants, even with the doors shut tight. I don't want to take the risk of introducing huge wind gusts in through the front doors, even though our frame has been well reinforced. I think this is the kind of thing that each one of us has to figure out on our own, based on our structure's orientation, and our own climates. Sounds like you've done a great job of making sure the frame won't flex easily. We had no issues with installing that wooden piece over the doors, and I do think it helped to stiffen that wall, so EMT should be fine there too. As an added bonus, I used that piece as somewhat of a "Curtain rod" to suspend Aluminet shade cloth curtains over the doorway. This way I can have the doors open for ventilation, but the shade cloth curtain helps deter birds from wandering inside, and it provides a bit of shade from our brutal west sun in the afternoon. Jackeblue, I have received an email from a new Harbor Freight greenhouse owner who lives in your neighborhood of Grass Valley. They are interesting in contacting you, for information about building this greenhouse in your specific climate. If you see this, and would like to drop me an email at mudhouse@q.com, I can put you in touch with each other. Hope your build is going well! Hello Mark, it sounds like you're making great progress. Congratulations on scoring the extra greenhouse for additional parts...you'll be able to put them to good use. The process is definitely a lot of work, but if the greenhouse provides you with years of enjoyment, as mine has, I think you won't regret all of your efforts. Hang in there, and best of luck with your continued build! Yup, still active in that I'm still responding to comments, although I haven't modified my original blog content for years...so some of it may be outdated, as Harbor Freight makes changes to the kits. You can reach a broader range of folks there, with different types of greenhouses, and they might be good for general questions about flooring, ramps, lighting, etc. I built up the entrance to my HFGH with steps made from paver blocks, but after years of lugging my heavy plants up and down those steps, I can clearly see your wisdom in considering a ramp! This is an awesome site. Thank you for your posts. I bought my wife this HFGH in December, for a Christmas present and finally got to start it about 3 weeks ago. I set mine on 4x6 PT and filled in with a mix of 3/4" gravel to crush and run. The frame is up and started putting the windo vents in when I found I was missing a window side. I called HF this am and the part should be here in about a week. I was hoping to have all the panels in this next weekend, but now will be doing some stiffening as you did. Wow this thing is a lot of work but hopefully we'll worth the happiness my wife gets from it. Hi Myron, sorry to learn about the missing part, but I'm glad they apparently had it in stock, and you won't have to wait too long. It's a bit better to find a missing part in the spring time, than to find a missing part in the fall (those folks can be in a bind, if trying to shelter plants from the oncoming winter!) Be vigilant with Harbor Freight though, and if it doesn't show up on time, ask them for a tracking number to make sure they've really and truly shipped it. I really think they've improved in recent years, but they used to be very loose about accurately assigning an arrival date for missing parts. It is a lot of work, I agree. But the fact that you're noting that gives me confidence you're putting in the little bit of extra effort that will help it be a lasting gift for your wife. The folks who tend to have the most problems with these are the ones who want to finish it in a weekend. I feel very bad for folks who buy the kit and don't know about the modifications that can make it last for years (instead of only months.) I know you won't regret the good foundation, or adding the stiffening to the frame. Be sure to put a screw or two in each of the panels; that's the biggest area of risk with these kits...panel loss from wind. Your wife is lucky to have a husband willing to do the work involved in making the greenhouse happen. (I know because I'm lucky that way, too.) Good for you guys, and best of luck on the rest of your build.